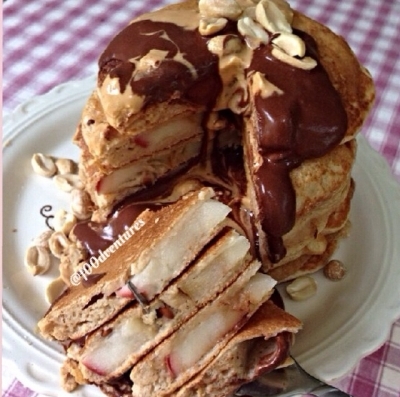 Apple ring pancakes are the way to go if you're looking for a yummy twist on traditional pancakes. The apple rings are cooked up inside the pancake batter which makes the apples incredibly soft and moist inside your pancakes. Easy to make and packed with flavor! Combine first 3 ingredients and mix well. Slice apple into apple rings. Make sure to keep them relatively thin so they cook up with the pancake mix. Heat up a skillet then dip your apple rings in the pancake batter and cook up like regular pancakes. Top with desired toppings.